Our clients can avail from us Glass Fiber Insect Screen from Saint Gobain, which is made of glass fiber by the means of filament ship plastic-coating process. Moreover, these Glass Fiber Insect Screen features well ventilation for sun shade and easy washing, anti corrosive, resistance to burn, stable shape and long service life. 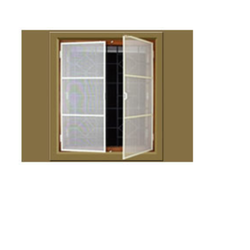 Additionally, our insect screen is used in all sorts of airy installation preventing insects and mosquitoes in construction, orchard, ranch, etc. Our clients can avail these products at highly cost effective prices. We welcome queries from Tamil Nadu including Chennai, Madras, Coimbatore, Kanyakumari, Nilgiris, Tirupur, Vellore, etc. Insect screens fitted in heavy aluminum frame is specially designed for this application at the jindal aluminum, bangalore. All the accessories are specially created to withstand rough handling and provides excellent service year after year. The aluminum frame comes in white, brown, honey gold and offwhite colours. Special colours can be made on request at very affordable extra cost. This frame gives added aesthetics to the existing interior/exterior and very easy operation makes it much easier to maintain. Fiberglass, stainless steel and bronze can be fitted on this aluminum frame. Insect screens fitted in sleek aluminium frame is specially designed for this application at the jindal aluminium, bangalore. All the accessories are specially created to withstand rough handling and provides excellent service year after year. The aluminium frame comes in white, brown, honey gold and offwhite colours. Special colours can be made on request at very affordable extra cost. This frame gives added aesthetics to the existing interior and very easy operation makes it much easier to maintain. We use a special kind of hinges making this aluminium framed insect screen totally be removed from the window frame at times of necessity and put back in position with ease. 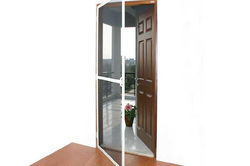 Fiberglass, stainless steel and bronze can be fitted on this aluminium frame. Looking for Saint Gobain - Glass Fiber Insect Screen ?